Goal oriented, hard working, and dedicated are just a few words that one may use to describe me as a person. I am interested in a position that I can use my skills and knowledge to help better not only myself but also the company which I would be working for. 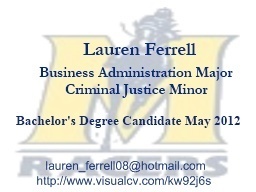 I am currently working on achieving my Bachelor of Science in Business degree in the field of Business Administration with a minor in Criminal Justices at Murray State University. I am an effective sales associate at JCPenney. I have received eleven customer service awards for my outstanding service.